New laptop, new docking station. But not the proprietary plastic tray of olden times; we’ve been trying out these new Anker USB-C mini-docks at work. 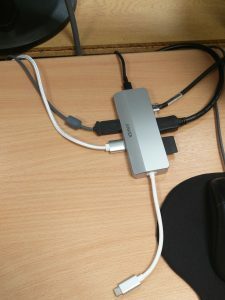 I’m really impressed by mine: one cable to plug in when I get to my desk, and I have power and networking, an external monitor and mouse, and an SD card reader. Oh, and a USB port left over which charges my phone even when the laptop isn’t on the dock. It does get properly toasty when the full set of ports are in use, but that’s not entirely a surprise. The other nice thing about these are that they can be used with recent Macbooks as well as PC laptops, and if the interface lasts, they’ll be re-usable for the next generation of laptops too rather than tied to one model. This entry was posted in Life, SysAdmin on January 28, 2018 by David North.